Here is the one piece of trivia you’ll ever need to know about Jack Hombsch: He broke the record for “most grounds played at” in 95 games where the previous record holders took 300 games and spanned the suburban Victorian and national eras. Hombsch managed this feat having started at GWS in their nomadic first year, debuting at Stadium Australia and playing in the only AFL game at Blacktown. He then moved to everyone’s favourite team to play at secondary home grounds, Port Adelaide. That’s seen him head to all four grounds in Tasmania and the Northern Territory, to Ballarat, and also Shanghai. Now, perhaps inevitably, he’s going to Gold Coast and has the opportunity complete the set of currently used grounds if selected in a Suns match in Cairns. Hombsch joins former Giants teammate Anthony Miles as the first players to play for both the Giants and Suns (we lied, there’s two pieces of Hombsch trivia you should know). Like Miles, he’s an out of favour player in his mid 20s who is potentially best 22 with a decent track record when he plays. At age 25, he is projecting to give Gold Coast a few years of that sort of footy. With Kolodjashnij and May departing, he should get his chances to prove himself in the Suns defence. The trade is pretty balanced. 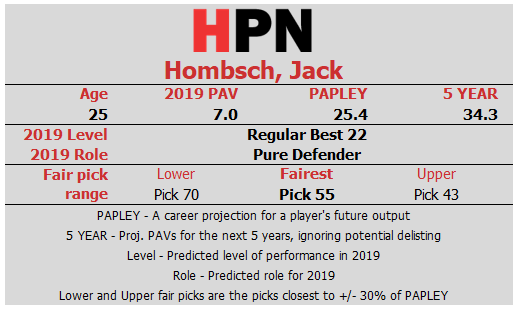 The remainder of Hombsch’s projected career, a few years of average but maybe useful footy, isn’t far off the sort of output one might expect from pick 61 in a club’s forward planning.